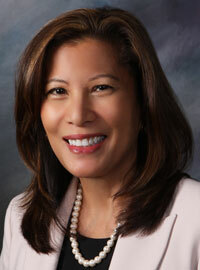 During her seven years in office, Chief Justice of the California Supreme Court Tani G. Cantil-Sakauye, who graduated from University of California, Davis, School of Law Class of 1984, has emerged as one of the country’s leading advocates for equal access to justice, transparency and the independence of the judiciary. Cantil-Sakauye will return to UC Davis to be the keynote speaker for the 2018 School of Law commencement at 4 p.m. on Saturday, May 19, at the Mondavi Center for the Performing Arts. The School of Medicine also graduates May 19, and the School of Veterinary Medicine will hold its commencement activities on May 26. When Chief Justice Cantil-Sakauye was sworn into office in January 2011 as the 28th chief justice of California, she was the first Filipina American and the second woman to serve as the state’s chief justice. In recent years, Cantil-Sakauye has raised awareness about the unfair financial impact of fines, fees and the bail system on the poor. And within the last year, she wrote an open letter to the Trump administration expressing her opposition to immigration enforcement agents apprehending individuals appearing for court dates. She said arrests at courthouses undermine trust in the community. The chief justice is a leader in revitalizing civic learning in the state through her Power of Democracy initiative. She, along with other state leaders, fulfilled one of the initiative’s goals in July 2016 when the state Board of Education unanimously approved an instructional framework that encourages civic learning. She has also convened leaders to address issues of implicit bias, human trafficking and truancy, which are part of a national movement to keep kids in school and out of the criminal justice system. Kevin R. Johnson, UC Davis School of Law dean and Mabie-Apallas professor of public interest law and Chicana/o studies, said Chief Justice Cantil-Sakauye’s participation in commencement has special significance. Since receiving both her undergraduate degree and Juris Doctor degree from UC Davis, the chief justice has been a longtime supporter of the law school and campus. Her sister is a graduate of UC Davis, her daughter is currently an undergraduate student of the university, and her niece is graduating with the School of Law’s Class of 2018. In 2011, she delivered the commencement address for the law school soon after being sworn in as chief justice of California. Approximately 250 J.D. and Master of Laws (LL.M.) students will receive their degrees at this year’s ceremony. All UC Davis commencements are on the Davis campus and are ticketed events for family and friends. None are open to the public. Dr. Paul Aronowitz — a professor in the School of Medicine and a renowned internal medicine specialist — will address medical school graduates earlier that day, May 19, in the Mondavi Center. The ceremony begins at 9 a.m.
Aronowitz graduated from Oberlin College and subsequently from Case Western Reserve University School of Medicine. He joined UC Davis in 2013 and is currently clerkship director of Internal Medicine, senior advisor to the Internal Medicine Residency Program and a member of the UC Davis School of Medicine Academy of Master Clinical Educators. He currently holds the Golden 1 Credit Union Endowed Professorship for Physician Training and has won numerous teaching and faculty awards. Dr. Andrew R. Clark, a veterinarian who also holds a master’s degree in business administration, is the keynote speaker for the school’s graduation on Saturday, May 26, at 11 a.m. A business coach for veterinarians, he received both his bachelor’s and Doctor of Veterinary Medicine degrees from UC Davis. Clark’s extensive experience in multiple business enterprises helps veterinarians, as well as company executives, to be successful through sound leadership and management practices. He has worked with countless veterinarians, adept at patient care, to understand the financial performance of their enterprise and employ strategies to help them reach their business objectives. The class of 2018 also selected faculty speaker Dr. Patricia Pesavento, a veterinary pathologist who divides her time between the diagnostic pathology service and her research interests in the identification and characterization of naturally occurring infectious diseases. Pesavento received her doctoral degree in 1997 from Harvard University and her DVM from UC Davis in 2000. Other speakers include UC Davis Chancellor Gary S. May, Dean Michael Lairmore and student speaker Jordan Cole. At this 67th commencement ceremony the school will celebrate the graduation of 133 DVM students, 30 residents and seven Master of Preventive Veterinary Medicine students.